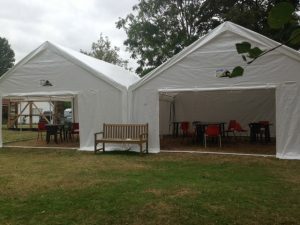 Waveney & Blyth Arts owns two high-quality marquees measuring 6m x 6m which can be erected separately or together to form a covered space of 6m x 12m. When these are not in use they can be hired by members and community organisations. Hire rates – Weekend (Friday to Monday) £300 for one or £500 for two, including delivery, erection and collection within Waveney & Blyth area. For longer bookings or delivery outside the area prices on application. Contact [email protected]. Confirmed on return of a signed hire agreement and deposit of 50%, with the balance paid on delivery. The system enables people who are hard of hearing to listen to a person speaking using a personal set of headphones, complete with a volume control. Alternatively, people with hearing aids that are fitted with a telephone coil can use a neck-loop rather than headphones, which magnifies the volume of sound transmitted by their hearing aid. To operate the system, the person speaking must talk into a microphone fitted in a headset. The microphone is connected to a small transmitter pack which can be attached to their belt, trouser pocket or similar. Each person wishing to listen using the system will need to wear headphones or a neck-loop which are connected to a small receiver, again fitted with a belt clip. The system works both indoors and outdoors. The system includes a triangle-shaped microphone which can be used to transmit a discussion rather than an individual speaker. It should be used instead of the headset microphone, plugged into the transmitter, and placed in the centre of the group. Those listening to the discussion will need to use receivers in the usual way. Waveney & Blyth Arts owns a Canon Pixma iP8750 inkjet photo-printer which is kept at the Media Centre at The Cut Arts Centre, Halesworth. W&BA members can use the printer at specially reduced rates to print A4 and A3 size photos of professional quality. 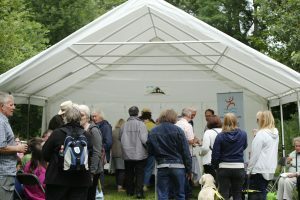 Costs are 60p each for A4 and £1 each for A3 size photographs, including the cost of the paper (normally matt finish) . Access to the facility is via Simon Raven who can be contacted at [email protected]. You will need a current membership card as user-ID and payment must be made at time of service use. The Media Centre has a suite of iMac computers with Photoshop and other specialist photo-editing software which are available for use. Further details on enquiry.